Miguel de Unamuno y Jugo (September 29, 1864–December 31, 1936) was a multi-faceted Spanish writer, an essayist, novelist, poet, playwright, philosopher, and educator whose essays had considerable influence in early twentieth-century Spain. Concluding that a rational explanation of God and the meaning of life could not be found, Unamuno decided that it was necessary to abandon all pretense of rationalism and simply embrace faith. His most famous work, Del Sentimiento Trágico de la Vida en los hombres y en los pueblo (1913 The Tragic Sense of Life), suggested that man’s desire for immortality is constantly denied by reason and can only be satisfied by faith, creating an unceasing spiritual anxiety which drives men to live the fullest possible life. This theme was further explored in La agonía del cristianismo (1925; The Agony of Christianity) which suggested that out of this spiritual anxiety comes the desire to believe in God and the need for faith, which reason cannot confirm. Unamuno was most influential as an essayist and novelist, although he also wrote poetry and plays. He regarded novels and dramas as a means of learning about life. His plays, borrowing from the austerity of classic Greek drama, opened the way for the renaissance of Spanish theater undertaken by Ramón del Valle-Inclán, Azorín, and Federico García Lorca. Unamuno also played an important role in the Spanish intellectual community, serving as rector of the University of Salamanca for two periods between 1900 and 1936, during a time of great social and political upheaval, and actively participating in political and philosophical discussions. Miguel de Unamuno y Jugo was born September 29, 1864, in the medieval centre of Bilbao, Spain, the third of six children of Félix Unamuno, a proprietor of a bakery shop, and Salomé de Jugo, who was also his niece. His parents were Basque. Afer his father died, Unamuno was brought up by an uncle. During his childhood, he witnessed the violence between traditionalist and progressive forces during the siege of Bilbao, an experience which deeply influenced his political thinking. Unamuno studied in his native city at the Colegio de San Nicolás and the Instituto Vizacaíno. As a young man, he was interested in the Basque language, and competed for a teaching position in the Instituto de Bilbao, against Sabino Arana. The contest was finally won by the Basque scholar Resurrección María de Azcue. In 1880, he entered the University of Madrid, where he studied philosophy and letters, receiving his Ph.D. four years later. Unamuno's dissertation dealt with the origin and prehistory of his Basque ancestors. During his early years Unamuno was deeply religious, but in Madrid he began to read the works of liberal writers in the library of the Ateneo, sometimes called the “blasphemy center” of Madrid. After receiving his doctorate, Unamuno returned to Bilbao and worked as a private tutor; together with his friends he also founded the Socialist journal La Lucha de Clases. He assumed the chair of Greek at the University of Salamanca, and in 1891 he married Concepción Lizárraga Ecénnarro, with whom he had ten children. In 1896-1897, Unamuno went through a religious crisis which ended his belief that a rational explanation of God and the meaning of life could be found. He turned, from the examination of universal philosophical constructions and outer reality, to the individual person and inner spiritual struggles in the face of questions of death and immortality. Understanding that reason leads to despair, Unamuno concluded that one must abandon all pretence of rationalism and simply embrace faith. Unamuno served as rector of the University of Salamanca for two periods: from 1900 to 1924 and 1930 to 1936, during a time of great social and political upheaval. Unamuno was removed from his post by the government in 1924, to the protest of other Spanish intellectuals, for publicly espousing the Allied cause during World War I. He lived in exile until 1930, first banned to Fuerteventura (Canary Islands), from where he escaped to France. Unamuno returned after the fall of General Primo de Rivera's dictatorship and took up his rectorship again. It is said in Salamanca that the day he returned to the University, Unamuno began his lecture with, "As we were saying yesterday, ...," as Fray Luis de León had done in the same place four centuries before, as though he had not been absent at all. After the fall of Rivera's dictatorship, Spain embarked on its Second Spanish Republic, a short-lived attempt by the people of Spain to take democratic control of their own country. Unamuno was a candidate for the small intellectual party Al Servicio de la República. The burgeoning Republic was eventually quashed when a military coup headed by General Francisco Franco caused the outbreak of the Spanish Civil War. Having begun his literary career as an internationalist, Unamuno gradually became a convinced Spanish nationalist, feeling that Spain's essential qualities would be destroyed if influenced too much by outside forces. For a brief period he actually welcomed Franco's revolt as necessary to rescue Spain from radical influence. However, the barbarism and racism displayed by the Francoists caused him to oppose both the Republic and Franco. As a result of his opposition to Franco, Unamuno was effectively removed for a second time from his University post. Also, in 1936 Unamuno had a brief public quarrel with the Nationalist general Millán Astray at the University, in which he denounced both Astray and the Francoists as a whole. Shortly after that, he was placed under house arrest, where he remained until his death on December 31, 1936. Unamuno worked in all major genres: the essay, the novel, poetry and theater, and, as a modernist contributed greatly to dissolving the boundaries between genres. There is some debate as to whether Unamuno was in fact a member of the Generation of '98 (an ex post facto literary group of Spanish intellectuals and philosophers that created by José Martínez Ruiz, a group that includes Antonio Machado, Azorín, Pío Baroja, Ramón del Valle-Inclán, Ramiro de Maeztu, and Ángel Ganivet. His philosophy foreshadowed the thinking of twentieth century existentialists such as Jean-Paul Sartre and Albert Camus. In addition to his writing, Unamuno played an important role in the intellectual life of Spain. Although he also wrote poetry and plays, Unamuno was most influential as an essayist and novelist. The theme of maintaining personal integrity in the face of social conformity, fanaticism, and hypocrisy appears throughout his works. His first published work was the essays collected in En torno al casticismo (1895), a critical examination of Spain's isolated and anachronistic position in western Europe. Vida de Don Quijote y Sancho (1905; Life of Don Quixote and Sancho) is a detailed analysis of the characters in Miguel de Cervantes' novel. Unamuno's novels are psychological depictions of agonized characters who illustrate his own philosophical ideas. Paz en la guerra (Peace in War) (1895)—a novel that explores the relationship of self and world through the familiarity with death. It is based on his experiences as a child during the Carlist siege of Bilbao in the Third Carlist War. Amor y pedagogía (Love and Pedagogy) (1902); a novel uniting comedy and tragedy in an absurd parody of positivist sociology, which describes a father’s disastrous attempts to raise his son scientifically. El espejo de la muerte (The Mirror of Death) (1913)—a collection of stories. Niebla (Mist) (1914), one of Unamuno's key works, which he called a nivola to distinguish it from the supposedly fixed form of the novel ("novela" in Spanish). Abel Sánchez (1917), his most famous novel, which uses the biblical story of Cain and Abel to explore envy. Tulio Montalbán (1920)—a short novel on the threat of a man's public image undoing his true personality, a problem familiar to the famous Unamuno. Tres novelas ejemplares y un prólogo (Three Exemplary Novels and a Prologue) (1920)—a much-studied work with a famous prologue. El Cristo de Velázquez (1920; The Christ of Velázquez), a study in poetic form of the great Spanish painter, regarded as a superb example of modern Spanish verse. La tía Tula (Aunt Tula) (1921)—his final large-scale novel, a work about maternity, a theme that he had already examined in Amor y pedagogía and Dos madres. Teresa (1924)—a narrative work that contains romantic poetry, achieving an ideal through the re-creation of the beloved. Cómo se hace una novela (How to Make a Novel) (1927)—the autopsy of an Unamuno novel. Don Sandalio, jugador de ajedrez (Don Sandalio, Chess Player) (1930). "San Manuel Bueno, mártir" (Saint Manuel the Good, Martyr) (1930)—a brief novella that synthesizes virtually all of Unamuno's thought. The novella centres on a heroic priest who has lost his faith in immortality, yet says nothing of his doubts to his parishioners, not wanting to disturb their faith, which he recognizes is a necessary support for their lives. 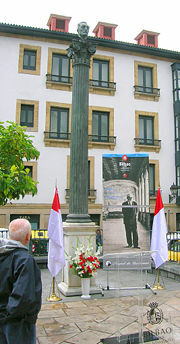 Homage to Unamuno in Bilbao. Unamuno's philosophy was not systematic, but rather a negation of all systems and an affirmation of faith "in itself." He developed intellectually under the influence of rationalism and positivism, but during his youth he wrote articles that clearly show his sympathy for socialism and his great concern for the situation in which he found Spain at the time. The title of Unamuno's most famous work, Del Sentimiento Trágico de la Vida en los hombres y en los pueblo (1913; The Tragic Sense of Life), refers to the passionate human longing for immortality when faced with the certainty of death. Unamuno suggested that man’s desire for immortality is constantly denied by reason and can only be satisfied by faith, creating an unceasing spiritual anxiety which drives men to live the fullest possible life. This theme was further explored in La agonía del cristianismo (1925; The Agony of Christianity). Unamuno was an early existentialist; later authors such as Jean-Paul Sartre confirmed the human desire for immortality, but Unamuno developed it further. According to Unamuno, we not only desire immortality for ourselves, but for our friends and family, our homes and nations, and all aspects of life. This desire to live forever exactly as we do now is an irrational desire, but it is this desire that makes us human. Out of the conflict between our perpetual desire for immortality and our reason comes the desire to believe in God, the need for faith, which reason cannot confirm. An important concept for Unamuno was intrahistoria, the idea that history could best be understood by looking at the small histories of anonymous people, rather than by focusing on major events such as wars and political pacts. Unamuno's Del Sentimiento Trágico de la Vida as well as two other works La Agonía del Cristianismo (The Agony of Christianity) and his novella "San Manuel Bueno, mártir," were included on the Index Librorum Prohibitorum of the Catholic Church until the Second Vatican Council of the 1960s and are still considered works that orthodox Roman Catholics are encouraged not to read. Unamuno summarized his personal creed thus: "My religion is to seek for truth in life and for life in truth, even knowing that I shall not find them while I live." For Unamuno, art was a way of expressing spiritual conflict. The themes in his poetry were the same as those in his works of fiction: spiritual anguish, the pain provoked by the silence of God, time and death. Unamuno was attracted to traditional meters and, though his early poems did not rhyme, he subsequently turned to rhyme in his later works. El Cristo de Velázquez (The Christ of Velázquez) (1920)—a religious work, divided into four parts, where Unamuno analyzes the figure of Christ from different perspectives: as a symbol of sacrifice and redemption, as a reflection on his Biblical names (Christ the myth, Christ the man on the cross, Christ, God, Christ the Eucharist), as poetic meaning, as painted by Diego Velázquez, etc. Unamuno's dramatic production presents a philosophical progression. Questions such as individual spirituality, faith as a "vital lie," and the problem of a double personality were at the center of La esfinge (1898), La verdad (Truth, 1899), and El otro (The Other, 1932). In 1934, he wrote El hermano Juan o El mundo es teatro (Brother Juan or The World is a Theatre). Unamuno's theater was schematic; he adapted the austerity of classical Greek theater and did away with artifice, focusing only on the conflicts and passions that affected the characters. His greatest concern was representing the drama going on inside of the characters, because he understood the novel and the play as a means of gaining knowledge about life. Unamuno’s use of symbols for passion, and his creation of a theater austere both in word and presentation opened the way for the renaissance of Spanish theater undertaken by Ramón del Valle-Inclán, Azorín, and Federico García Lorca. Marías, Julián. Miguel de Unamuno. Cambridge, MA: Harvard University Press, 1966. History of "Miguel de Unamuno"
This page was last modified on 4 October 2018, at 15:27.